Join 2nd Watch’s next webinar where we’ll discuss Windows Workloads on AWS and how far Windows has evolved. In this session you’ll learn how to approach Windows on AWS from an operations, provisioning, and automation standpoint. Seamlessly extend your data center into the cloud with VMware Cloud on AWS. Join 2nd Watch and VMware to learn how you effortlessly transition into the cloud with a live discussion on getting started, moving and managing VMware workloads on AWS. Register and attend this webinar for a chance to win a 3rd Gen Amazon Echo Dot! Struggling with Windows in the cloud? Using SSM provides the tools needed to tackle your toughest operational challenges. Join 2nd Watch, an AWS APN Premier Partner, for a live webinar on how AWS SSM services can simplify Windows operations and further automate your cloud infrastructure. In this webinar you’ll learn how to create patch baselines, groups and maintenance Windows, push commands to an arbitrary group of systems, setup secure access directly and gather inventory reports to meet compliance needs and track infrastructure. REGISTER AND ATTEND the webinar and you'll be entered into a chance to win an Echo Dot! Cloud promises a simple pay-as-you-go approach to technology, with cost-savings at the top of the list. As more enterprises adopt the cloud, cost continues to be a major issue with new pricing models, services and features that introduce waste and complexity into the decision-making process. In this webinar, you’ll learn expert strategies that will amplify your cloud performance and maximize your ROI with a level of intricacy that can’t be solved using manual process – tools and expertise are needed. As organizations adopt the cloud, security governance is a key cornerstone to the long-term success of their transformation. Understanding the Shared Responsibility model of the cloud is important. Enforcing security policies with automation and reporting on the security status can be challenging, but necessary. 2nd Watch will share with you how we are helping our customers to adopt the cloud with a security posture for sustainable cloud adoption. As cloud computing continues to gain popularity, companies that are natively Windows question if they too can leverage AWS. This webinar will outline the benefits the cloud provides, best practices of cloud computing services, and solutions available on AWS for Windows workloads. Learn how Covanta is delivering services to its users 90% faster and saving more than 60% in IT infrastructure costs after migrating its Windows workloads to the cloud. Customers across the globe are moving past mono-cloud operations and driving fast to consume cloud capabilities from multi-cloud providers. As clients start to use this broad multi-cloud fabric, it becomes ever more important to start to look at new and innovative ways to centralize management and security. In this session we will cover the new paradigm of thinking around Realm Management, the ability to manage multi-cloud infrastructure security from one central point of management and start collapsing the cloud providers down to a mission-critical cloud fabric. With the Palo Alto product family under the VM Series platform in coupling with Panorama, we are able to bring to life a single pane of glass management initiative that allows for central security, control and management of Microsoft Azure and Amazon Web Services in one console. We will review the technical architecture surrounding this solution and discuss, in-depth, the principal around realm management of multi-cloud and how best to centralize security once and push across many cloud providers at scale. Enterprise customers are moving quickly to multi-cloud consumption, and single realm security management will optimize and enhance the way they manage enterprise cloud security going forward. Join 2nd Watch's Director of Engineering, Automation, and Product Development, Lars Cromley, as he takes you on a deep dive into how DevOps can increase security inherently in your organization. The ideas and methods on which DevOps operates and how that can result in producing more secure applications. From decreasing foot print to east-west security inside your applications, a high amount of communication is vital to success. Securing your infrastructure is an essential step during your journey to the cloud. 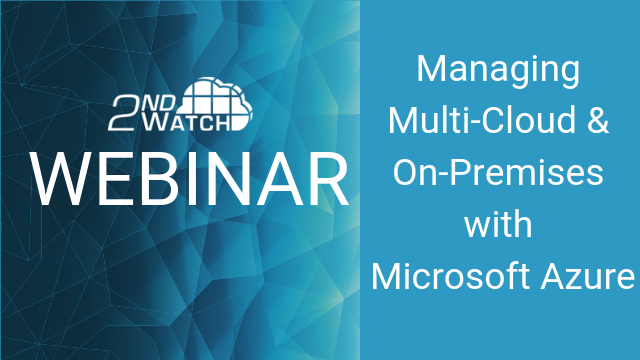 Join 2nd Watch for live webinar and take a deep dive into strategies for securing your Azure resources. During this webinar you will learn the best practices for console access, operating system access, as well as federation with third-parties. For decades, traditional relational databases have been the primary choice for data storage and persistence. These database systems continue to rely on monolithic architectures and were not designed to take advantage of cloud infrastructure. These monolithic architectures present many challenges, particularly in areas such as cost, flexibility, and availability. In 2016, Amazon Web Services Premier Partner, 2nd Watch, performed an analysis on the amount of AWS billing data that they had collected, and the number of payer accounts they had processed over the course of the previous year. The results of that analysis revealed that their single MS SQL server instance could no longer support the rapid pace at which the company continues to grow and on-board new clients. Join AWS Premier Partner, 2nd Watch, for a live webinar on Migrating Microsoft SQL Server to Amazon Aurora on Monday, June 26 at 10am PST / 1pm EST and hear how they successfully migrated their Microsoft SQL Server to Amazon Aurora to help them meet customer demands and prepare for future growth. As more and more enterprises are moving to the cloud for its scalability, agility, convenience and cost savings, it’s important to have insight and control over your cloud costs and billing. By gaining comprehensive visibility into your cloud spend you can properly allocate your costs to your financial reporting structure, track costs associated with each workload, prepare for unexpected cost spikes and dips and encourage accountability among your business units. Join Amazon Web Services Premier Partner, 2nd Watch, for a live webinar on Managing AWS Billing and Cloud Costs on Monday, May 15 at 10am PST / 1pm EST. As organizations create increasingly complex software applications, IT development teams evolved their software creation practices for more flexibility, moving from waterfall models to agile or lean development practices. Today, DevOps designates a set of tools, processes, best practices and corporate management guidelines that make an IT organization more agile and more efficient. While the software tools and practices promoted by DevOps practitioners are well understood, rigid infrastructures reduce the benefits and hinders the application of agile methods. Join Amazon Web Services Premier Partner, 2nd Watch, for a live webinar to learn more about how to get the right approach to DevOps and Containers in the cloud. •What are the benefits of DevOps? •How can we measure success? Looking for a simplified cloud bill? With over 30,000 SKUs and a rapid pace of innovation, AWS cloud billing information is often complex and one-dimensional. Allocating costs across your organization – to the right departments and projects – can be time-consuming, but you need to accurately track how your company is using the public cloud in order eliminate wasted spend and resources. Join AWS Premier Consulting Partner and Managed Service Partner, 2nd Watch, for a live webinar to learn how to better understand your AWS bill. We’ll look at a real AWS bill and break down its components, dissecting the raw data and AWS’ billing organization model. Then we’ll look at some tools available to simplify your cloud billing. With these tools, you can achieve multi-dimensional views, detailed billing, and chargebacks by project and/or cost center to increase visibility into how your company is spending each day. Hear from guest speaker Don Burr, Director of Delivery Services at AIG about how the global insurance company is using 2nd Watch’s Cloud Cost Accounting tool to simplify and manage its AWS billing and usage. Some of the biggest issues facing enterprises moving to the public cloud are security and compliance. The public cloud may have security built into it, but you still need to build it into your applications, especially if you need to be compliant with regulations like SOC 2, PCI DSS, SOX and HIPAA or are working in several different regulatory jurisdictions. Even if your company is not subject to regulatory requirements, these frameworks serve as great starting guidelines to achieve a strong security posture. These standards mandate that security operations adequately protect customer information, but protecting today’s complex IT infrastructure is increasingly a challenge. Join 2nd Watch, Alert Logic and SCOR compliance and security solution experts for a live webinar to learn how to not only meet compliance requirements, but build out a top-notch security practice for your organization. Join AWS Premier Partner, 2nd Watch, for the Modern Application Architecture in the public cloud webinar. Learn about modern application development methodologies for the public cloud - including how to leverage the cloud to improve application development and business agility, - the new way of orchestrating application and systems architecture for the cloud and modern IT, and which AWS services and tools to use for modern application architectures. Join AWS Premier Partner, 2nd Watch, and AWS Advanced Partner, Cycle Computing, for the Orchestrating Big Data & Analytics in the public cloud webinar. Learn how public cloud services enable you to churn through massive amounts of data quickly and efficiently to help you solve complex business problems. Find out about the challenges of big data and big compute in the cloud and how to overcome those obstacles. From monitoring and reporting to auditing and compliance, the public cloud can help you manage your database to make better decisions based on your data faster and at lower costs. Join AWS Premier Partner, 2nd Watch, and AWS Advanced Partner, New Relic, for the Digital Marketing on AWS webinar. Learn what services enable you to build and host powerful websites on AWS, decrease hosting costs and analyze application behavior to turn your data into actionable results. From concrete to application, with 2nd Watch and New Relic you can tie the entire stack into your Digital Marketing efforts to ensure your digital marketing campaigns run smoothly on AWS. The cloud is quickly becoming the topic of conversation when it comes to financial services and managing IT costs. More and more financial services businesses are moving to the cloud, not only for convenience and ease of use, but also for cost savings and asset management. By gaining insight into your cloud costs and resource usage, you can track trends and prepare for unexpected cost spikes and dips, as well as encourage accountability among your business units. Join 451 Research and 2nd Watch for a live webinar on Asset Management & Tagging on Tuesday, November 18 at 10am PST / 1pm EST. There is a lot of chatter in the marketplace today about cloud computing. It seems that everyone has a cloud offering, and given the multitude of data out there, it can be confusing. Which cloud provider is going to provide a best of breed, flexible environment that will help you achieve your business goals? Where do you start? How are other companies approaching the cloud? 2nd Watch and Amazon Web Services will provide an in depth look at these questions to de-mystify the translation between on premises IT and cloud IT to get you started on the right foot in your transition. From cost savings to business agility, we’ll show you how building your infrastructure on the cloud will increase your ROI and productivity. 2nd Watch manages the public cloud for enterprises and helps automate the development, deployment, governance, procurement, financial management, migration and operations for business critical workloads. The company’s software and services extend and automate every day workload management processes for the public cloud including: big data analytics, digital marketing, line-of-business and cloud native applications. By combining proven methodologies, public cloud expertise, certified personnel and patent-pending automation software, 2nd Watch is currently delivering managed cloud and automation across more than 300 enterprise workloads and more than 75,000 instances.